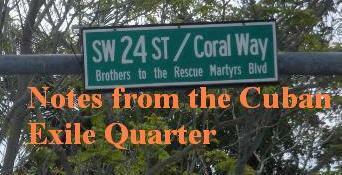 Notes from the Cuban Exile Quarter: April 13th is the Day of Remembrance for the Victims of the Katyn Massacre. 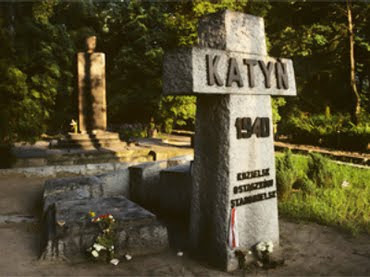 April 13th is the Day of Remembrance for the Victims of the Katyn Massacre. The Soviet Union claimed to enter Poland in September of 1939 to "take care" of the people and seven months later beginning in April 1940 they had executed 22,000 Polish officers and buried them in mass graves in what became known as the Katyn Massacre. Today is the day of remembrance for the victims. Let us remember and place this crime into its historic context. On September 17, 1939 with "between 600–650,000 soldiers and over 5,000 thousand Red Army tanks [of the Soviet Union] invaded the Second Polish Republic, which had been fighting against German aggression since 1 September." The Soviet Union "invaded Poland on the pretext that ‘the Polish country and its government ceased to exist’. Consequently, ‘the USSR had to take care of the people who lived in Western Ukraine and Western Belarus and their possessions’ as the Soviet propaganda referred to the eastern regions of the Second Polish Republic." ... " About 230,000 [Polish] soldiers and officers and thousands of military service representatives were taken captive by the Bolsheviks." The reality was that the Soviets had entered into a non-aggression pact with Nazi Germany that included secret protocols dividing up Poland. 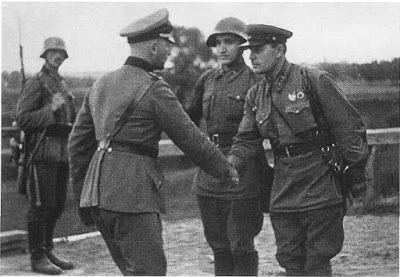 Nazi and Soviet troops met in the middle of Poland and exchanged pleasantries in September of 1939. The Soviet precursor to the KGB was the NKVD. "From October 1939, the delegated NKVD officials from Moscow heard the prisoners, encouraged them to cooperate and collected data. Only a few of the prisoners agreed to collaborate. The commanding officers’ reports included opinions about hostile attitudes of the Poles and a minimal chance of them being useful to the USSR authorities." The decision to shoot the prisoners was signed on March 5, 1940 by seven members of the All- Union Communist Party (Bolsheviks) authorities: Joseph Stalin, Lavrentiy Beria (proposer), Kliment Voroshilov, Vyacheslav Molotov, Anastas Mikoyan, Mikhail Kalinin and Lazar Kaganovich. In the Spring of 1940 the Soviet secret police began to shoot the prisoners in the back of the head or in the neck and burying them in mass graves. On 3 April, the first prisoners from Kozelsk were transported in cattle trucks through Smolensk to Gniezdovo, where smaller groups were transported by prison cars commonly called ‘czornyje worony’ (‘black ravens’) to the wilderness called Kozie Gory in Katyn Forest. The functionaries of the NKVD killed each person by shooting in the back of the head. By 11 May, 1940, 4,421 Polish citizens had been killed and buried in Katyn death pits. There is an assumption that some officers had been killed in Smolensk28. The first group of prisoners from Starobelsk camp was transported to the headquarters of the Board of Kharkov NKVD district on 5 April 1940. Every night in the basement of the building in Dscherschinski Street executioners killed prisoners by shooting in the neck. The trucks carried the bodies to the pits in Forest Park in Kharkov, a kilometer and a half to Piatykhatky village. By 12 May 3,820 Polish citizens had been killed in Kharkov29. On 4 April, 1940, the NKVD started to send prisoners from Ostashkov to the headquarters of the Board of Kalinin NKVD district (today’s Tver) at 6 Soviet Street. The executions took place in the basements. The same method of killing was used: a shot to the neck. In the mornings trucks carried the bodies to the pits in Miednoye village, 30 kilometers further away. By 22 May, 1940, 6,311 Polish citizens had been killed in Kalinin. What is worth mentioning when it comes to the Katyn lie, is that the territory of Miednoye cemetery has never belonged to Germany30. Polish authorities built war cemeteries at the places where the officers’ bodies had been buried. The cemeteries were officially opened in the year 2000. (in Kharkov on 17 June, in Katyn on 28 July and on 2 September in Miednoye)31. Only 395 people from the three camps survived. Some of them owed their rescue to pure chance. Several people were willing to fight on the Soviet side in case of German invasion. There were also agents among them, the same ones as the NKVD had in the camps. The officers who were arrested in the camps and transported to NKVD Lubyanka prison in Moscow also managed to escape death in the summer of 194032. The Guardian summed up the crime as follows: "Joseph Stalin ordered his secret police to execute 22,000 Polish army officers and civilians in 1940, in one of the greatest mass murders of the 20th century." The first book in English on the Katyn Massacre was published in 1951. In the U.S. Congress the Madden Committee conducted an exhaustive investigation in 1952 that concluded that the Soviet Union had committed the atrocity. 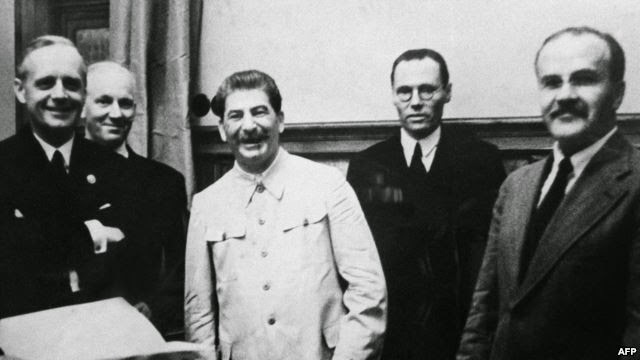 Eighty years ago on August 23, 1939 the Molotov Ribbentrop Pact was made public. It was a Nazi-Soviet Non-Aggression Pact with secret protocols setting out how the two regimes would divide Poland and the Baltic States. World War 2 would begin with the invasion of Poland by Nazi Germany less than a month later on September 1, 1939. The Soviet Union invaded Poland from the East on September 17, 1939. The double invasion is dramatized in Andrzej Wajda's 2007 film Katyn. On March 5, 2019 the Russian human rights group Memorial launched a crowdfunding campaign to to have the victims of the 1940 Katyn massacre published in a Russian Book of Memory.